You can improve the experience of viewing reports in the mobile apps by creating a portrait layout. In Power BI Desktop and the Power BI service, you rearrange and resize report visuals for an optimal experience in portrait mode. Looking for information about viewing reports on a mobile device instead? 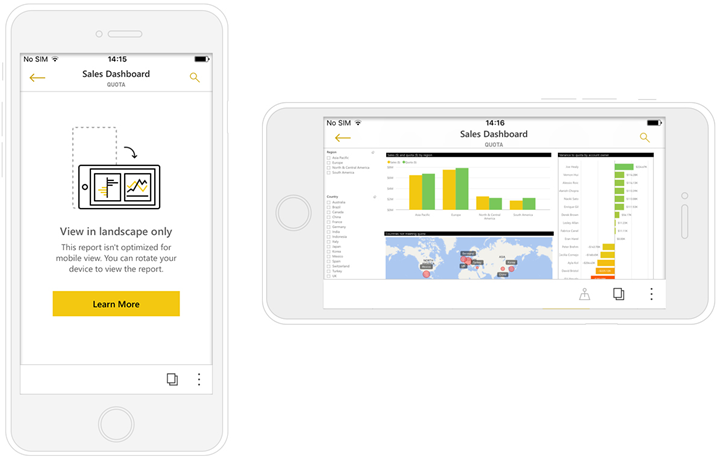 Try this quickstart Explore dashboards and reports in the Power BI mobile apps. Plus you can create responsive visuals and responsive slicers that resize well anywhere. If you add filters to your report, they show up automatically in the optimized report. After you create a report, you can optimize it for phones and tablets. 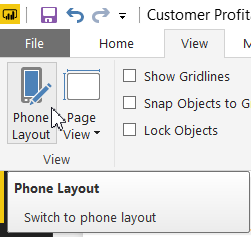 In Report View in Power BI Desktop, on the View tab, select Phone Layout. In the Power BI service, select Edit Report > Mobile Layout. You see a blank canvas shaped like a phone. All of the visuals on the original report page are listed in the Visualizations pane on the right. To add a visual to the phone layout, drag it from the Visualizations pane to the phone canvas. Phone reports use a grid layout. As you drag visuals to the mobile canvas, they snap to that grid. You can add some or all the master report page visuals to the phone report page. You can add each visual only once. You don't have to include all the visuals. You can resize your visuals on the grid, as you would for tiles on dashboards and mobile dashboards. The phone report grid scales across phones of different sizes, so your report looks good on small- and large-screen phones. You can set the visuals in your dashboard or report to be responsive. They can change dynamically to display the maximum amount of data and insight, no matter the screen size. As a visual changes size, Power BI prioritizes the data view. For example, it can remove padding and move the legend to the top of the visual automatically, so the visual remains informative even as it gets smaller. You choose whether to turn on responsiveness for each visual. Read more about optimizing visuals. For reports with multiple pages, you can optimize all the pages or only a few. If you've defined a background color for a report page, the phone report will have the same background color. You can’t modify formatting settings for just the phone. Formatting is consistent between master and mobile layouts. For example, font sizes will be the same. To change a visual, such as changing its formatting, dataset, filters, or any other attribute, return to the regular report authoring mode. Power BI provides default titles and page names for phone reports in the mobile app. If you’ve created text visuals for titles and page names in your report, consider not adding them to your phone reports. To remove a visual, click the X in the top-right of the visual on the phone canvas, or select it and press Delete. Removing the visual here only removes it from the phone layout canvas. The visual and the original report aren't affected. Decide if report readers can select only one or more than one item. Put a box around the slicer to make the report easier to scan. Make the slicer vertical, horizontal, or responsive. If you make the slicer responsive, as you change its size and shape it shows more or fewer options. It can be tall, short, wide, or narrow. If you make it small enough, it becomes just a filter icon on the report page. Read more about creating responsive slicers. To publish the phone version of a report, you publish the main report from Power BI Desktop to the Power BI service, and the phone version publishes at the same time. Read more about sharing and permissions in Power BI. In the mobile apps on phones, Power BI automatically detects optimized and unoptimized phone reports. If a phone-optimized report exists, the Power BI phone app automatically opens the report in phone report mode. If a phone-optimized report doesn’t exist, the report opens in the unoptimized, landscape view. When in a phone report, changing the phone’s orientation to landscape will open the report in the unoptimized view with the original report layout, whether the report is optimized or not. If you only optimize some pages, readers will see a message in portrait view, indicating the report is available in landscape. Report readers can turn their phones or tablets sideways to see the page in landscape mode. 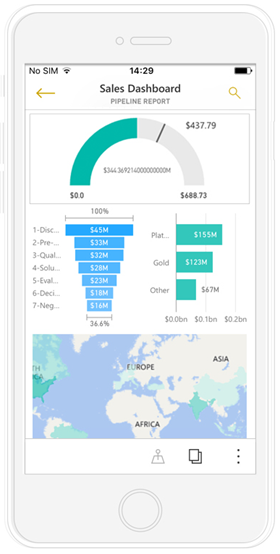 Read more about interacting with Power BI reports optimized for portrait mode.